Coil Unit – Unique and original cooling system control the temperature with in 2 deg Celsius, Optimized design to minimize the thermal effect. Ceramic Quill – Ceramic weigh less than half of cast iron quill, thermal expansion is 1/3 of cast iron and excellent insulator, all together brings the stable and repeatability in machining. 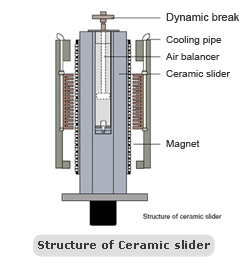 In linear motor die-sinker EDM , the Z-axis is absolutely contact free and jump speed can go up to 36m/min. In contrast the ballscrew drive system has speed limitation because of the thermal expansion of the ballscrew creates inconsistency in machining. No shape deformation because of no secondary discharges. 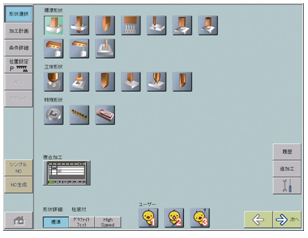 LN assist is the simple automatic menu driven and interactive programming system to select machining conditions for variety of applications as shown in the picture. LN Assist programs are easy to handle even for the beginners and are capable to create NC programs for any type of complex application. LN Assist stores data more than 10,000 machining conditions. By inputting the machining depth, electrode material, required finish, electrode clearance and loran pattern, the program finds an optimum condition and creates NC programs. It covers a horizontal servo and other complex applications. Further more operator is allowed to manually edit an program with a simple operation. LN Assist is with several support functions like free loran setting, multiple parts machining, macro machining and part edit etc. The new electrical discharge circuit ‘Arc-less,’ which is installed standard, enables no arc machining. Problems traditionally associated with EDM machining can now be achieved with greater anti-arc capabilities sharp edges, superior high speed machining. Only one electrode can handle entire machining process from roughing to finishing! The cost of making multiple electrodes can be greatly reduced! Set-up time can be significantly reduced! Errors in handling multiple electrodes can be reduced! Higher grade machining is made possible, leading to huge improvements in productivity and cost-reduction. With copper electrodes, the machining speed and accuracy can be greatly improved. Moreover, with the use of ‘SVC’ circuit the surface finish can be uniformly and efficiently controlled to provide high-grade texture or mirror surfaces in a very short period of time.